It’s been almost a year since I moved to Cbus, and I can finally say I have a #1 option for a restaurant: the Northstar Cafe. I can’t tell you exactly when in that year my Northstar infatuation began, but I can tell you that it all started with their Chopped Salad. If you’ve ever gone to a restaurant with me, I’m sure you know that salads are one my frequent orders because I’m gluten-free. But what it’s not so frequent is to order a salad that eats the rest of the dishes for breakfast. 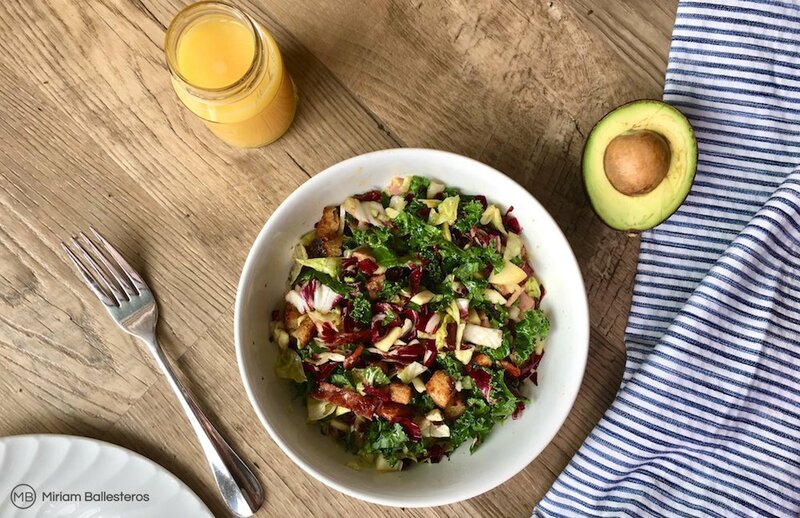 That’s why today, I’m bringing the Chopped Salad experience to you with my quick and easy version of it. The preparation time of this version of the “Northstar” salad is <20 minutes, and it serves two to three people. Here is the list of ingredients I use for the salad and its café vinaigrette. Combine all vinaigrette ingredients in a small bowl, and whisk together. Top with the additional ingredients: applewood smoked ham, uncured turkey bacon, avocado, Pt. Reyes blue cheese, almonds, gluten free croutons and apple. The secret’s out! This is literally the easiest homemade “Northstar” salad ever. I’ve eaten this salad for lunch and/or dinner so many times, and it just keeps getting better and better… AND BETTER. Hope you like it as much as I do. Bon appétit!